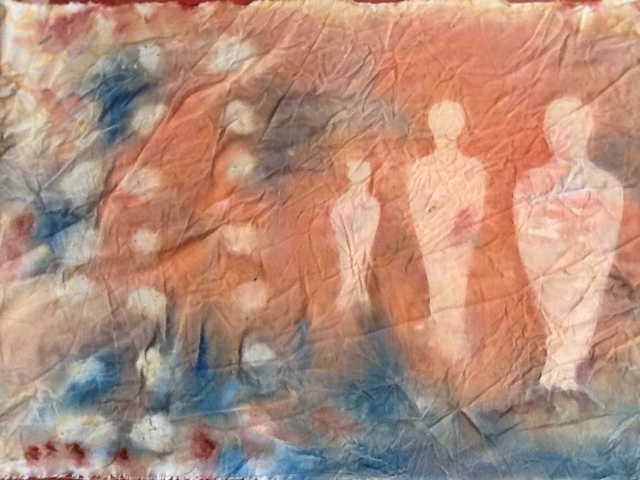 After trying to play with design for my last set of four journal quilts and not enjoyed the experience, I decided for this four, I would use them to continue to explore the themes in my main body of work. I'm not sure if that made it easier or whether I just found shades of yellow as the designated theme easier to work with than shades of red. I did bend the yellow a little to include some yellowy brown. Of the four, I think this is the least successful. I'll show you the others over the next few days. 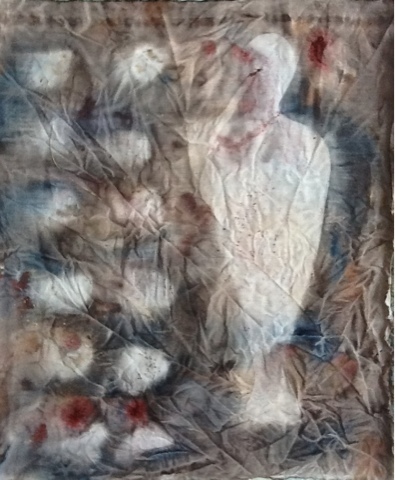 I collaged some newspaper onto fabric and then painted over the top. I think the contrast between the black print and the yellow paint did not leave much room to allow the stitching to come to the forefront, no matter what colour I used. However, it was a useful exercise to try and I will use the technique again, but with a darker paint! After posting this morning that I would send a copy of the blog post about the Best in Show to the Guild, Liz Whitehouse, the Chief Executive of the Guild left a comment on the original post and left a link to an update on the Guild's website. You can read it by clicking here. I think it is great that the Guild has responded so quickly and it is useful to find out a bit more about how these things work. It can seem a bit cloak and dagger when you are not involved, even if that is not the intention. I'm still not convinced it was the best choice for the future of British quilting; I feel it was a missed opportunity. But perhaps it is now time to move the discussion away from this year's Best in Show and have a debate about how we want to showcase the best, cutting edge quilting at the premier quilt show in Europe. I have been really surprised by the number of comments that were made on the post about the Best in Show at the Festival of Quilts. It seems that I have really hit a nerve and I'm pleased that others have been willing to comment and come out into the open about it, as I was rather unsure whether I should make such comments publicly myself. Although my initial comments were on the Best in Show, it seems there is a lot of disgruntled makers about the judging comments they have received too. I know that the judging is subjective, but the judges were meant to have been through a judging course and some of the comments I have read, imply the judges really didn't seem to understand the category or that the criteria they were being asked to mark against were wrong. Rather than just leave all this mouldering on the blog, I'm going to send a copy of the blog post and comments, along with the related comments on facebook to both the organisers and the Guild. I'll let you know if I get any response. Using typical British understatement, weather-wise this summer has not been one of the best. However a few weeks ago, we had three or four days sunshine in a row. It was lovely. I got out in the garden to pick fruit and do some tidying up, whilst trying to avoid being water bombed by the children. It was only on the final day of sun that I remembered I had wanted to try out some sun dyeing of fabric. I quickly covered some trays with cling film and got out the fabric paints. I had been musing ways of getting my figure shapes onto the fabric and in the end covered the paper figures with parcel tape to stop them soaking up the paint. As well as the figures, I added some stones. 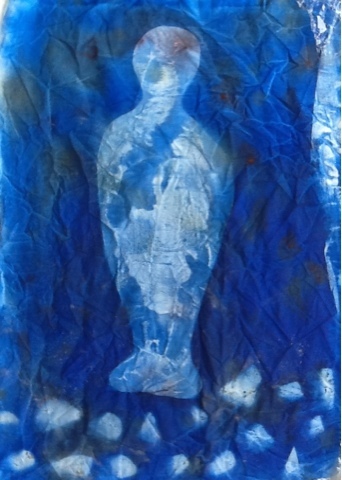 The taped figures worked well and left a strong impression, particularly on the blue paint. I think the mottled effect on the blue is because I used freezer paper for it. I discovered I had to be careful where I placed the weighting stones so that they didn't cast shadows. The fabric now needs to be ironed to heat set the paint and then washed to remove the sand. The sand from our sand pit has got everywhere this summer and the fabric currently has a really grainy feel. Now I've just got decide how I use it. Any ideas? I've thought long and hard before writing this, as I don't like to be negative and criticise people, especially hard working volunteers who try to do the impossible job of making quilting appeal to as many makers as possible. However... I was so disappointed by the judges decision at the Festival of Quilt. According to them, the 'Best in Show' was a humorous group quilt about the quilting olympics. It was full of quilting in-jokes and emphasised stereotypes about quilters being fat middle aged women (For the record, I am neither and it would be nice not to be made to feel the exception by works like this). What this work says to non quilters is beyond me and it just doesn't give positive forward thinking vibes about the craft. I can understand this being the viewers choice, selected by visitors, who appreciate the in-jokes and often work which stays with you long term has less instant appeal as it takes time to mull over the design and thought processes. But Best in Show? The best in show is picked from the winners of each category and I find it hard to comprehend how it could be considered better than the pictorial or art quilt winners, on a level of design or technical skill. Obviously these are the categories that interest me the most, but just look at the the traditional winner and the miniature was technically amazing too. How can this one be the best in show? When it was announced I could have wept, especially after a similar quilt made by the same group won last year. I didn't say anything last year, but two years in a row makes me seriously consider whether I wish to be part of a Guild which considers this to be the pinnacle of quilting in Great Britain today. All the more ironic when a lot of the Guild time seems to be taken up with obsessing why they are not attracting more younger members. I don't think I need say any more! Back to more positive posts next time. Last weekend I spent a fantastic four days at the Festival of Quilts at the NEC, Birmingham. Each time I go there, I meet up with old friends and meet some lovely new people, which is fantastic. I was meant to be teaching, but unfortunately it had been cancelled by the organisers as not enough people had signed up. If you had signed up, I'm really sorry and I would have happily run the class with the smaller numbers of students. This meant I had four days just to wander and enjoy the show and of course chat to lots of people. As always the work on show is mixed, some galleries and art work are very exciting, others leave me wondering why I quilt! This year the highlight for me was the European Art Quilt gallery. Some pieces were beautiful, others had strong composition, all very thoughtful and brilliantly executed. No photography was allowed and although I bought the catalogue with a disc of images in it, I don't think I am allowed to reproduce them here. I can't wait to write about these works for Popular Patchwork. I was allowed to take photos of the competition quilts so here are some that I liked.